There’s nothing quite like enjoying the fresh air while dining outdoors with family and friends. If you want to throw a dinner party on your patio, but you’re not quite sure how to set an outdoor table, follow these tips to make the experience memorable. Evening elegance: Use ferns as a table runner and white flowers of your choice as the centerpiece. When you choose neutral linens in whites, creams or tans, you can easily adjust your place settings and centerpieces for outdoor parties throughout the year. Your outdoor table should have a high-quality cloth or plastic tablecloth and a cloth napkin for every guest. Every outdoor table should have a theme-appropriate table runner to set the stage for your party. Your table runner doesn’t have to be traditional, though. 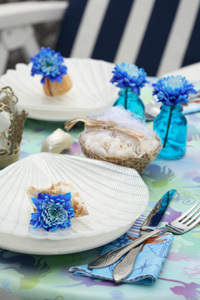 You can use leaves, flower petals, bandanas, seashells or napkins to create a runner-esque look. Under every place setting should be a placemat or charger. Like the runner, you don’t have to use a traditional placemat or charger, but you should use this piece as an opportunity to incorporate your theme. For instance, if you used the “fun sandcastle” theme, you could spread a fine layer of sand over the top of a colorful charger. You may think that paper plates, napkins and plastic utensils are the way to go when dining outdoors, but high-quality plastic ware will last years and is more environmentally friendly. If you plan on using and reusing your outdoor dishes, choose a neutral color or style so you can adjust themes easily. 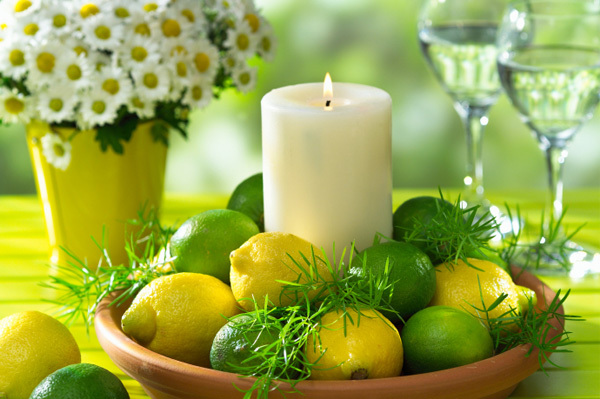 Every outdoor table should have a centerpiece, and depending on the length of the table, you may need several centerpieces placed intermittently. Regardless of your theme, start building your centerpiece with clear, glass vases. You can fill them with flowers, sand, whole fruit or candles. When setting your table, make sure you have a plate, glass and utensils for every guest. Place several clear carafes on the table to dispense water, tea or lemonade to your guests, then allow them to choose other beverages from a secondary drink location. If you’ll be dining as the light dims, make sure you have candles, garden torches, lanterns or another light source near the table so that guests will be able to see each other as they dine. Host Debi Lilly is on Nantucket and shares tips and tricks to setting an outdoor table.